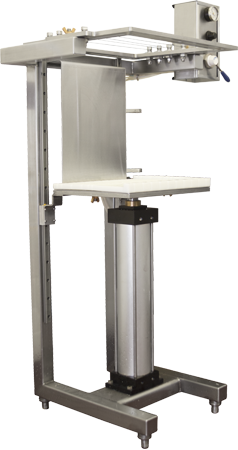 The Dairy Heritage air-powered cheese cutter saves time and produces consistent cut sizes. It uses customizable wire harps for cutting. Unlike some other cheese cutters, the wire harps on the Dairy Heritage cutter are adjustable. If you no longer need a certain cutting configuration, you can reuse the harp by repositioning the wires. 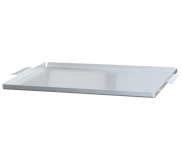 Our drain table is great for working with soft cheeses on turning trays. This drain table has raised edges, a sloped surface, and a drain that can be clamped to a hose. 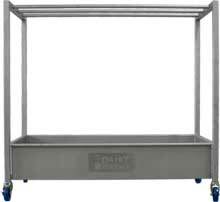 The Dairy Heritage cheese bag drain trolley allows you to drain the whey from soft cheeses during the manufacturing process. It catches the whey for future use or for transfer to a whey collection system. 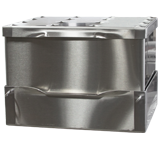 The heavy-duty stainless steel casters have greaseable swivels and wheel bearings, and provide increased mobility and ease of use. 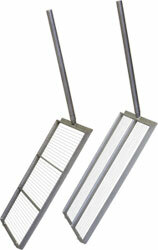 Cheese bags hang by stainless steel S-hooks from heavy-duty draining racks.